Gazzetta dello Sport has apologised for publishing a cartoon of Mario Balotelli which showed the Italy striker recreating the role of King Kong. 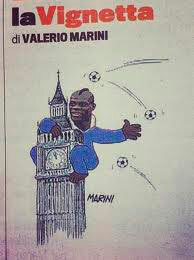 The illustration – published on the day of Italy’s Euro 2012 meeting with England – showed Balotelli on top of Big Ben in a reference to King Kong on New York’s Empire State Building. It has led to a number of complaints from readers prompting the newspaper to apologise. A statement from Gazzetta read: “Some of our readers have protested regarding (Valerio) Marini’s cartoon. “Balotelli was depicted as King Kong. We can honestly say it was not among the best products of our talented cartoonist. “At this time, a measure of prudence and good taste are necessary because everything, absolutely everything, can be misinterpreted. “The newspaper is for those who read it and hence, if certain readers found the cartoon offensive, we apologise. “But those that accuse Gazzetta (and poor Marini) of racism are going overboard. Balotelli, you may recall, was the player who said he would walk off the pitch if he was subjected to racist abuse at Euro 2012. Little did he know that the only controversy he would encounter would originate in his homeland. Fears that Euro 2012 might turn Ukraine into one big unlicensed brother, have not materialised as the number of clients for prostitutes has not increased during the tournament. Ukrainian Ombudsman for Children’s Rights, Yury Pavlenko, said beforehand certain that many “supporters” would come to the country for sexual pleasures, rather than the football, and that they would resort to children to satisfy their lust, the Komsomolskaya Pravda claimed. It was therefore recommended for Ukrainian parents to take their children out of the hosting cities – Kiev, Kharkov, Donetsk and Lvov. A slightly hysterical reaction to a problem that did not exist but mercifully, such warnings proved far of the mark and according to the prostitutes themselves, there has been no increase in the number of clients during the course of the tournament. The quarter final between England and Italy is expected to be the most-watched quarter-final game in the competition’s history, UEFA has revealed. European football’s governing body said that according to figures submitted from the first 20 markets, 100 million viewers worldwide watched Sunday’s match with more than 100 broadcasters still to report their numbers. In Italy, 21.8 million watched the game, while an average of 20.3 million people watched the game on the BBC in Britain, which was the highest quarter-final audience since Euro 2004 when 20.7 million people watched England lose to Portugal on penalties. People sure do seem to enjoy watching England get knocked out on penalties. UEFA said the figures for the England-Italy match surpassed the 13.6 million who tuned in to watch Prince William’s wedding to Kate Middleton last year and the 14.7 million for Queen Elizabeth II’s Diamond Jubilee Concert this month. UEFA said that a total of 1.3 million people had attended group stage and knock-out matches at the eight venues in Poland and Ukraine so far, while a further 4.9 million had watched the games in the fan zones. England’s 3-2 Group D win over Sweden was the best-attended match, with 64,640 people in Kiev’s Olympic Stadium; the most-watched game in fan zones was England versus Ukraine, when 273,250 people turned up – most of whom were to return home disappointed. England manager has criticised predecessor Fabio Capello’s comments about striker Wayne Rooney as “cheap”. Rooney had alluded to communication problems under Capello, caused by the Italian’s inability to speak English fluently. Capello, who managed England for four years before resigning four months before Euro 2012, told Italian radio that the Manchester United striker “only understands Scottish” because he only played well for Sir Alex Ferguson. “After watching the last game (the Euro 2012 quarter-final defeat by Italy) I think that Rooney understands only Scottish,” Capello retorted. Hodgson was full of praise for Rooney’s commitment and was unhappy with Capello’s remarks. “Capello is entitled to his opinions, I suppose. I don’t know what relationship he would have had with Wayne but I always think it’s a bit cheap to kid on a player who was so anxious to do well,” he told TalkSPORT. “His attitude was magnificent. He was putting in extra work in training because he was concerned he was behind the others having missed the first two games through suspension. So to was his belly, though, which might have had something to do with his failure to do himself justice at Euro 2012. Andres Iniesta has found himself in the unaccustomed position of having to defend his side’s style of football. Perceptions of Spain are changing and where once there was a blanket endorsement of their simple virtues of possession, now the mood is less respectful and the once feted tiki-taka now stands accused of killing the spectacle and boring opponents – not to mention supporters – into submission. Death v Spain comes not via a knockout punch to the chin, but from a series of perfectly executed light jabs to the body which eventually disorientate the opponent. At times it does indeed appear to be a recreation of the bullfight: Spain as the nimble matador v the slow moving, exhausted bull. Iniesta who is no more likely to relinquish possession of the ball than Andy Carroll is to control it, believes the criticism of Spain is unfair. “Not everyone likes the same things and not everyone agrees on everything,” he said. “It’s the diversity of opinion that makes it so special. “We have our own style, which has brought us success and given us two trophies. But all opinions are valid, and I respect them. “The truth is that when you have a team that always attacks, and you attack against closed defences that leave no space, of course it’s not as attractive as an open match between two teams that want to win. Indeed it should be. In the stampede to jump aboard the backlash bandwagon, it should not be forgotten that very few teams try to outplay Spain; most simply park the bus and hope to emerge relatively unscathed. In that context, which team is the boring one? The team trying to score or the team trying to stop them scoring? France midfielder Samir Nasri has apologised for insulting a journalist after his team were knocked out of the Euro 2012 quarter-finals by Spain last Saturday. “Too many untruths circulate at the moment. May the fans, and the children in particular, know that I regret sincerely that my words may have shocked,” he said on his Twitter feed. Not an apology as such then, merely an acknowledgement that his language was inappropriate. “I love the France team, I love football and I have deep respect for the fans. For the rest, it’s a personal matter between me and some journalists. I will explain myself in due time,” Nasri added. Clearly the Euro 2012 bonus hasn’t shown up on his bank statement yet. Joachim Low explains why he won’t be man-marking Andre Pirlo when Germany meet Italy on Thursday. It’s a risky tactic; England didn’t bother to man-mark him either, and that could hardly be deemed an unqualified success. Some thoughts on tonight’s semi-final between Spain and Portugal from the press in the respective countries. “If Spain wants to make history by not only qualifying for but also winning the final … it will have to face Cristiano who, for his part, knows that his second Ballon d’Or – following that won in 2008 – is being hotly contested with Leo Messi, and may very well depend on the events of this game.” That’s from Marca, who are somewhat conflicted by tonight’s game in that they’re a Spanish newspaper, but also the de facto in-house publication for Real Madrid. El Pais draws parallels between the way Portugal and Real Madrid play. Portugal’s Publico says the second final in Portugal’s history could be determined by the trickery not of Romaldo, but of coach Paulo Bento. Keep an eye out during tonight’s game to the body language of Spanish defenders, Gerard Piquet and Sergio Ramos. Apparently, the pair don’t get on, but Piquet has been swift to deny reports of a rift. “It’s true that we miss (the injured Carles) Puyol, but Sergio is a player with a great deal of quality. With every game we are improving as a partnership,” Pique told reporters. “There has been a lot of talk about problems that don’t exist. Rio Ferdinand has criticised England boss Roy Hodgson for employing inconsistent and ill-advised tactics at Euro 2012 that led to the team’s exit from the competition. Ferdinand’s criticisms should be placed in the context of his omission from England’s Euro 2012 squad by Hodgson, but as an experienced international, it’s unwise to ignore him altogether. “I am a fan of ‘The Ox’ (Alex Oxlade-Chamberlain) and I wanted to see more of him but in the end he finished up as a spectator,” he said, discounting the 1 start and two sub appearances he made in Ukraine. “Phil Jones is one of the most adaptable players we have in our country and where was he? “When we need to take the ball from midfield, run 40 yards with it and put the other team on the back foot, he is the man for the job. Hold on a moment. Jones is a converted central defender, who started the season at full-back before moving into central midfield. A Phil of all trades, if you like. The idea that this non-specialist midfielder would be able to to advance 40 yards through the Italian midfield seems fanciful. True, he would have been no worse in that role that Jordan Henderson, but you could have employed a wardrobe in place of Henderson and the team wouldn’t have suffered. Moving on to the man of the match, Andre Pirlo, Ferdinand couldn’t resist the temptation to make a dig at Hodgson. “If Pirlo was English would he have made the squad let alone been on the pitch?” asked Ferdinand.